Computers are not quite like TVs - when you turn them on, you actually interact with your computer in many ways. This takes some training, both for the computer and for you. For our part the SureDesk™ is a balancing act to find the optimal balance between four separate goals: performance, cost efficiency, flexibility and security. Our commitment is to provide solutions that to the greatest extent possible provide the best of each of these goals. Most of you will have had years of training with your physical PCs, Macs and Laptops. We've worked very hard to make the SureDesk™ as similar as possible, but it's just a little bit different in some ways and a little bit the same in others. The better you can understand the SureDesk™, the better the experience is likely to work for you. The SureDesk™ does not exist anywhere that you can touch it. We rely on "virtualization" technology to assemble your SureDesk™ from servers that deliver Memory, Processing Power and Applications that are all stitched together to present you with a "virtual" desktop. Virtual - One main difference is that you can't kick it or bang it and you never have to listen to the fan whir or get dusty. Out of Sight - This means, however, that when you want to shutdown or start the computer you have to issue it commands, rather than pull the plug or hit the start button. Bandwidth - Bandwidth is the biggest factor affecting day to day variations in performance. Bandwidth is affected by literaly dozens of servers and networks between our DataCenter and your fingers. Typing - this is most significantly affected by Bandwidth. When you type, your keystroke goes at the speed of light to our DataCenter. The DataCenter then sends back a Video Image of your SureDesk™ which is a LOT more data than your keystroke. If there is any delay in internet capacity getting out of the DataCenter, going over the internet or getting down to your workstation, then you will experience a delay between what you type and what you see on your SureDesk™ screen. Lot's Of Moving Parts - We and the several partners that work together to bring the SureDesk™ to you are continually improving performance of bandwidth, hardware configurations, software performance, and multiple Network factors that influence using applications on the SureDesk™. Any time you experience variations in performance, please let us know and we'll help diagnose the cause and help with anything that can be done to improve your experience. Adaptability - we have a tremendous amount of flexibility with what we can do, adjust and control to server your workflow. We continue to improve our toolset and expertise for your benefit every day. Limitations - The SureDesk™ is designed as a business computer. It can support all Office Products and business applications including all Office, accounting, legal and even CAD software. But the SureDesk™ does not yet support Skype. Familiar Comforts - Just like you're used to you have your favorites and desktop backgrounds. You can work exactly the same way you are used to and your applications launch and interact with your files the same as you are used to. Any Windows operating system can crash from time to time when using Outlook or any other software. please report to us frequent crashes which should be reapaired, however. Memory Leaks - you should logoff your SureDesk™ every time you are going to walk away for an extended period (over 2 hours). To do this click START -> Log Off. Please note once you are looking at the SHUTDOWN dialot it is important to CLICK RESTART and NOT shutdown so that your SureDesk™ is waiting for you next time you want to login. If you select shutdown then the next time you login your computer well be off and will take up to 20 minutes to come back to life - see Restarting below. Hang on to your knickers - Like all Microsoft XP machines you should be sure to allow an application to fully open before trying to open another one. If you overtax your machine (like any other) it can crash. Restarting - the SureDesk™ can be restarted from on Off state or from a crash from our SureDesk™ logon portal at http://so.suretech.com. Just click Restart pictured to the right and then re-logon. 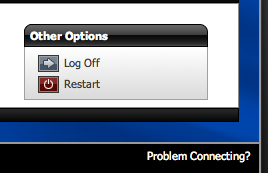 The Restart Bug - The current infrastructure has a Bug around the logon website. It can show a status of "starting" when it's not really starting. You should never wait more than 8 minutes for your computer to start. If it takes longer, your SureDesk™ is mostly likely still off, and not really restarting. To fix this you should Delete Temporary Items in your browser and then, you need to try Restarting, above, again. Getting More Power - If your machine is slow RAM can be an issue. If you are a "power user" running a lot of applications at once or eve type fast, you may want to upgrade your RAM. The SureDesk™ with Windows XP supports up to 3GB of RAM. Close Applications Properly - For example, every time you close QuickBooks it is essential to follow the Intuit recommended steps. You must select File, then "close company" AND THEN you must select File "exit QuickBooks" The instinctive thing to do for many users is just click X on the QuickBooks window. This will close the program, but it could louse up the company fiel and cause QB to not launch correctly the next time.